Sep 24 (IRIN) Sixteen months after the end of the civil war in northern Sri Lanka, thousands of former rebel fighters are still missing or in government detention, according to the government and a local NGO, Law and Trust Society. Anusha Ravichandran, 15, and her family lost contact with 16-year-old Dharisah two months after the LTTE rebels forcibly recruited her in March 2009. more..
Sep 24 (DM) Traditional Industries Deputy Minister Veerakumara Dissanayake was sworn in before Prime Minister D.M. Jayaratne as Acting Minister while subject Minister Douglas Devananda was in Sri Lanka. Deputy Minister Dissanayake was sworn in on the thinking that Minister Devananda had accompanied President Mahinda Rajapaksa to the United Nations but Minister Devananda was in Jaffna and was not a part of the Sri Lankan delegation. more..
Sep 24 (NF) Rs. 70 million, being taken from the main office of a commercial bank, was robbed by a gang who swooped on the van carrying the money at Thelangapatha, Wattala around 1 am today. The money was being taken to be placed automatic teller machines (ATMs) at the branches of the bank in the area. Police media spokesman SP Prishantha Jayakody siad that the money was being transported in the van along with two security guards at the time of the incident. more..
Sep 24 (DM) The Government claims that Sri Lanka has an advanced intelligence service in collaboration with India with shared information and any terrorist activity in the region would be picked up by this service. Minister Keheliya Rambukwella made this statement in response to a question on the report sent to the Sri Lankan Government by the US on the possibility of there being 200 LeT cadres planning to use Sri Lanka as a staging ground to enter India. more..
Sep 24 (Island) Deputy Highways Minister Mervyn Silva yesterday told Parliament that he has evidence to prove that former Army Commander Sarath Fonseka ordered the assassination of the then Sunday Leader Editor Lasantha Wickrematunga. "I have the evidence with me and I appeal to the government to launch an inquiry into the Wickremetunga assassination," Deputy Minister Silva told Parliament, more..
Sep 24 (DN) In choosing to die the way he did and where he died, Rajiv Gandhi's end was the death-knell of the separatist movement in Sri Lanka and ended the larger political sympathy for Sri Lankan Tamil separatism in India, Indian Express Editor-in-Chief Shekar Gupta said. He was addressing the inauguration ceremony of the study courses in International Relations at the Bandaranaike Centre for International Studies (BCIS) last week. 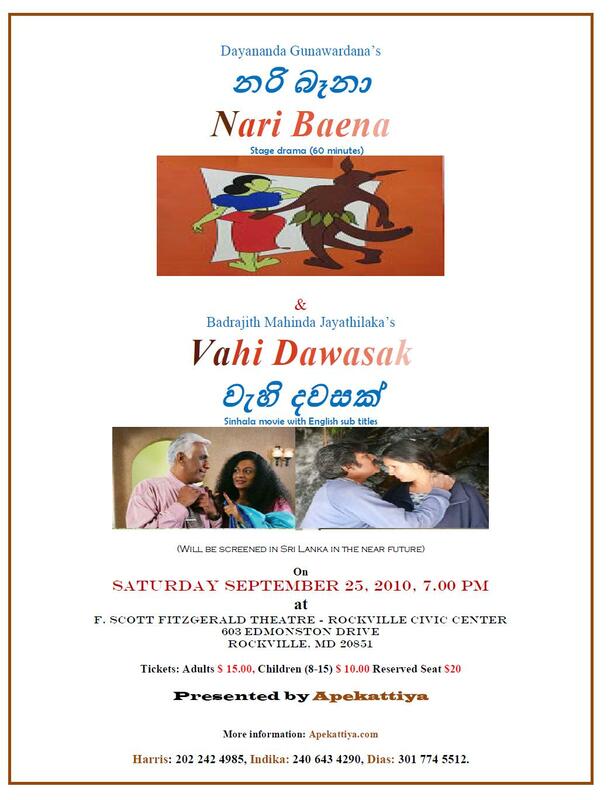 more..
Sep 24 (IL) Sri Lankans in the Greater Washington DC area will get to enjoy a rare treat of a Sinhalese stage drama and a Sinhala movie in one sitting, on Saturday, September 25, 2010, at 7 p.m., at the Rockville Civic Center in Maryland, when Ape Kattiya present Dayananda Gunawardana�s Nari Baena and Badrajith Mahinda Jayatilaka�s Vehi Dawasak with English subtitles. (Click on flyer for details). more..
Sep 24 (DM) Contradicting the Statements of President Mahinda Rajapksa at the UN last evening, the UNP claims that poverty is yet to be significantly reduced in Sri Lanka and thus the achievement of the Millennium Development Goals is still out of reach. �The Millennium Development Goals consider per capital income and the reduction of poverty. The present assessment of the President has been made based on the 15.2 per-cent figure obtained in 2006/07, more..
Sep 24 (DM) The UNP MPs appeared to be confused in Parliament yesterday as to what was to be done during the vote on the extension of the state of emergency, with three members abstaining and the others voting against, along with the TNA and DNA MPs. The emergency was extended for a further period of one month, with 112 votes for it and only 20 against. MPs Lakshman Kiriella, Joseph Michael Perera and Ranjith Madduma Bandara abstained from voting. more..
Sep 24 (DM) Former Army Commander and DNA leader Sarath Fonseka yesterday filed an application in the Appeal Court challenging the first General Court Martial decision to convict him on charges of doing politics while in the army. In his writ application retired General Fonseka said he was convicted on evidence given by former UNP MP Johnston Fernando who had allegedly struck a deal with the government to free him from a criminal investigation where more..
Sep 24 (Island) Close on the heels of a move to do away with the CMC to pave the way for an authority, IGP Mahinda Balasuriya yesterday called a media briefing at police headquarters, where the police top brass explained why they had been compelled to intervene to ensure the CMC carried out its duties. The police chief explained action taken by the Colombo police on a Defence Ministry directive to support the CMC and other civilian agencies tasked with keeping the city and its suburbs clean. more..
Sep 24 (Island) UNP and Opposition leader Ranil Wickremesinghe yesterday said in Parliament that the army couldn�t violate DNA leader Sarath Fonseka�s right to attend sittings. An irate Wickremesinghe accused the army of depriving the former army commander of his privilege as a parliamentarian. The Military Court which sentenced MP Fonseka last week, was against the Constitution, Wickremesinghe said, more..
Sep 24 (Island) Ruling out sabotage or terrorist activity, IGP Mahinda Balasuriya says a Chinese engineer was responsible for the Karadiyanaru blast. He had mishandled detonators, the police chief said. The IGP called last Friday�s blast nothing but an industrial mishap. Balasuriya rejected a recent JVP claim that a rivalry between two countries, engaged in major construction projects in the northern and eastern provinces, may have led to the blast. more..
Sep 25 (BBC) A court in Sri Lanka has released four suspects arrested on charges of conspiring to overthrow the government. They are among scores of supporters of former army chief Sarath Fonseka, who was arrested after his unsuccessful bid for the presidency. A senior serving military officer, two retired major generals and a defence columnist are among those freed. The senior army officer released on Friday is also accused of being involved in a high-profile murder case. more..
Sep 25 (Hindu) Looking at expanding its business in Sri Lanka after the end of the 30-year-old conflict, the Taj Group of Hotels on Friday announced rebranding and reclassification of its hotels in the Island nation. �Taj has been among the first hospitality entrants in this country and today we wish to commit ourselves to a renewed relationship with Sri Lanka,� said Mr Raymond Bickson, MD & CEO, Indian Hotels Company. more..
Sep 25 (DM) The public hearing by the US State Department on alleged violations of labour rights in Sri Lanka will be held in Washington on Tuesday,government sources said today. Statements from representatives of the Sri Lankan government and Trade Unions would be recorded, Free Trade Zone Workers Union (FTZWU) President Anton Marcus who complained to the State Department said he would also be testifying at the inquiry. more..
Sep 25 (DM) The Government has given the green light for a private university to be established in the Sabaragamuva province, Chief Minister of the province Mahipala Herath said. �Several rounds of discussions had been held in this regard with private universities in the US, India and Belarus and the proposed university would be established soon in collaboration with an institution that would meet the needs of the social, economic and more..
Sep 25 (IANS) The tribunal examining the ban on the LTTE reserved its order on the application filed by the MDMK general secretary Vaiko, seeking to be made a party in the matter. Through his application, Vaiko challenged the government's May 14 notification and pleaded before the court to be heard as one of the parties. Delhi High Court judge Justice Vikramjit Sen is the one-man tribunal set up by the central government to go into the validity of the ban, more..
Sep 25 (LT) Four students of Peradeniya University have been sent to remand prison yesterday for two weeks. They have been kept in prison on allegations of detaining Minister arbitrarily under anti-ragging act. The convenor of Inter University Student Federation Mr. Udul Premarathna in response to the question raised by Lanka Truth said that when Minister S. B Dissanayaka visited the University of Peradeniya the students have 'booed' in protest to the Minister. more..
Sep 25 (Forbes) Sitting in his glass-walled corner office on the 34th floor of Manhattan's IBM building, Raj Rajaratnam marveled at his own success. It was Thursday, Oct. 15, 2009, and on his huge curved desk nearly a dozen outsize computer screens tracked every movement in markets around the world. A pudgy man, prone to spasms of self-preening, Rajaratnam was feeling great. Many hedge fund rivals and friends from Greenwich, Conn. were finished, casualties of government probes or the recession. more..
SSep 25 (LBO) Sri Lanka's government may take away more money from the salaries of private sector workers to set up another pension fund, a government minister said, amid concerns about the management of an existing fund. The new pension fund may take up to two percent from the salary of a private sector worker and make employers contribute another two percent, labour minister Gamini Lokuge said. more..
Sep 25 (LG) The United National Party of Sri Lanka is in its death bed breathing its last breath. It would die a chaotic death which makes it slightly different from the death of the old left which was relatively peaceful. UNP deserve to die for the evils that its leaders have created for the country. JR. Jayawardana introduced all forms of corruption, a rogue constitution and an autocratic rule and died an unceremonious death without many people shedding tears. more..
Sep 25 (LG) Chamila is a resident of Biyagama and the youngest in her family. She is 31-years-old and married with two children. Her husband from whom she is now separated is in prison for another case. She looks much older than her age as a result of difficulties she has under gone. She was sentenced five times under the vagrant�s ordinance and this time was for the same offence. She has faced economic difficulties since childhood and went to school up to grade 7. more..
Sep 25 (TD) Earlier today in New York, Mahinda Rajapaksa told the United Nations General Assembly that he aims to make Sri Lanka �one of the top 30 countries for doing business by 2014� (while focusing also on recovery, peace and equality for its society overall). That goal might have seemed farfetched even just a couple of years ago, but with its economy growing this year at its fastest rate since 2002, the situation for Sri Linka is clearly improving. more..
Sep 25 (LG) It is an almost weekly occurrence now that the Sri Lankan police report the shooting to death in custody of a criminal when he attempted to throw a hand grenade at the officers. I am not sure what annoys me more, the incredibly poor standard of policing in the country or the fact that the Sri Lankan police think that we are all idiots. Let us take the typical scenario (two of which occurred within the last few weeks). more..
Sep 25 (LG) Today�s news item in a local daily about the construction of a hotel in Murugandy upset me. The construction of the massive building in close proximity to the Hindu Temple at Murugandy, that remained a mystery during its construction, has now come to light. It is now revealed that the building is to house the Testa Bake House, not only to bake bread and allied items but also plans to make available some other facilities such as rest rooms, meals etc. more..
Sep 25 (LG) It is with great dismay I learn that a Muthamil Vila is going to be celebrated at Kilinochchi for 3 days from the first of October, under your patronage. Several representations had been made to me to contact you and to have it cancelled. The General Public of Kilinochchi, I would say a good number of them, want the Muthamil Villa cancelled, since the time in not opportune for merry making. more..
Sep 25 (wsws) A Sri Lankan court martial convicted former army chief Sarath Fonseka last Friday on a charge of violating military procurement procedures and sentenced him to three years jail. Fonseka, who is also head of the opposition DNA, was found guilty of breaching procedure in purchasing night vision-devices, generators, batteries and VHF direction finders while serving as army commander. more..
Sep 25 (TC) Why has it been difficult to write of this novel, In the same boat, slight in frame and simple and direct in approach? While I finished the novel in one go, whenever I sat down to write about it, it proved a difficult task. Of course from the beginning I knew it was not going to be easy writing about the book. Despite the simple and direct approach of Channa�s writing, my feelings about the novel were far from being simple and direct. more..
Sep 25 (BS) Even as state-run NTPC Ltd is finding it difficult to get over environmental hurdles for executing its projects in India, the first overseas power project of the company, in Sri Lanka, has got a big incentive from the local government for smooth implementation. The Sri Lankan government has offered a 25-year tax waiver and customs duty concessions to its 500 Megawatt power project planned at Sampur near Trincomalee more..
Sep 25 (DM) The Grade 5 Scholarship high flyers are indeed the talk of the day and Daily Mirror had the opportunity to meet them, their teachers, principals and of course their parents, to find out the reason behind their success. Sanuja Kalhan Edirisinghe of Dharmapala Vidyalaya, Pannipitiya, who gained 196 marks at the examination, was positive that he would pass the exam well. In fact, he was confident that he would become first in results. more..
Sep 25 (FE) Chennai-based Indian Bank is opening a branch in Jaffna, the capital city of Northern Province of Sri Lanka. The bank, which caters mainly to the Tamil Diaspora in overseas locations, already has a branch in Colombo. Indian Bank had been operating in that part of the neighbouring country from 1914 but closed its branch afterwards. It decided to start afresh its operations in the country after Sri Lankan President Mahinda Rajapaksa asked more..
Sep 25 (DM) Elections Commissioner Dayananda Dissanayake will be allowed to relinquish his duties soon, the government informed Parliament yesterday. It was also revealed that he had officially retired from his post from January 28, 2002 while the normal monthly salary of Rs 73,165 had been paid to him to date. Chief Government Whip Dinesh Gunawardene revealed this matter in the House responding to more..
Sep 25 (NF) An incident is reported from Bopitiya in Pamunugama, where a crowd accompanied by policemen played havoc in disrupting the livelihood of a villager by enacting an ancient ritual bordering on witchcraft that is used to locate stolen items. Although this individual's name had never been listed on a police log book before, a situation has now arisen, where he has been unable to work in his regular profession as a mason from the 19th of this month, more..
Sep 25 (NF) Environment in the South is being destroyed in order to develop the North, says Tissa Karaliyedda, Minister of Child Development and Women's Affairs. The minister expressed this view speaking to the media following a religious programme at the Galeda Purana Raja Maha Vihara in Halmillewa, Kebithigollewa yesterday. �Certain projects are being carried out to destroy our environment. more..
Sep 25 (DM) Agriculture Minister Mahinda Yapa Abeywardana has decided to put an end to the import of potato, vegetable and onion seeds immediately in a bid to promote local varieties. The import of seeds costs the government over Rs.1 billion annually. Minister Yapa has appointed a Task Force to study the seed import process and make recommendations to produce 100% of the required seeds locally. more..
Sep 25 (LBO) A five-year bond issued by Sri Lanka's Urban Development Authority (UDA), a state agency, to raise 10 billion rupees which opened Thursday has drawn 4.6 billion rupees, a stock exchange filing said. The UDA is issuing 50 million debentures at 100 rupees each, to be doubled if oversubscribed, to raise cash to resettle squatters occupying prime property in Colombo city owned by government and to free land for private sector commercial development. more..
Sep 25 (MoD) Army Para Games 2010 ceremoniously concluded with the participation of over 1000 disabled war heroes at Army Grounds today (24 Sep) evening. Secretary Defence Mr. Gotabaya Rajapaksa graced the occasion as the chief guest. War Heroes, who sacrificed their legs and limbs to bring the lasting peace to the country, showcased their multiple sport talents in the Sri Lanka Army Para Games 2010 tournament. more..
Sep 25 (BBC) A leading Buddhist monk has claimed that Tamils have had to face numerous difficulties as they have not been able to use their mother tongue as desired. The Ven. Dr.Bellanwila Wimalaratana Nayaka thera said that it is high time that the Tamil language be given due recognition. The Venerable Dr Bellanwila Wimalaratana thera, the Viharadhipathi of the Bellanwila Raja MahaVihara who is also the more..
�Learning Lessons� from those affected by war: Does the LLRC really listen? Sep 25 (GV) The most recent sessions of the Lessons Learnt and Reconciliation Commission (LLRC) were held in the conflict affected North from 18 to 20 September, at which a large number of persons, particularly women, made representations. Of course one wouldn�t know it by reading the newspapers, listening to the radio or watching television. In what appears to be a complete information blackout, Sinhala and English language media, more..
Sep 25 (GV) The platform for an �genuine reconciliation� should be rooted via the democratic exercises, rights and participation of all citizens throughout a country. But, if people are under fear to express their grievances and aspirations, including opposition political parties, dissident voices, independent media and even some ruling party government ministers how can a national minority discriminated and oppressed for more..
Sep 25 (Hindu) The Coast Guard and the Indian Navy have decided to hold an urgent meeting with the Sri Lankan Navy to discuss ways and means to stop �physical attack� on Tamil Nadu fishermen. Though the venue of talks is yet to be decided, the meeting is expected to take place in a week considering the recent complaints of attacks on the Indian fishermen by the Sri Lankan Navy. more..
Sep 25 (Island) The message President Mahinda Rajapaksa eloquently delivered in his speech at the 65th Session of the UNSG on Thursday was loud and clear. Having finished the war, he said, the focus of Sri Lanka was now on 'building a lasting peace, healing wounds, ensuring economic prosperity and guaranteeing the rights of the whole nation to live in harmony'. He spelt out the measures his government had adopted to realise those goals and revealed to the world leaders that more..
Sep 25 (DM) One has to admit that President Mahinda Rajapaksa did sound quite confident at the United Nations General Assembly when he spoke about the need to review international law so that it would suit the current global context. The teleprompter would certainly have helped but the President also sounded quite convinced of what he was talking about. It was a matter of convincing the world of what he believes in and whether the international community bought more..
Sep 25 (LBO) The International Monetary Fund has released 212.5 million US dollars to Sri Lanka under its 2.5 billion US dollar program, backed reform proposals and suggested that the central bank move away from its quantity targeting monetary framework. "Further improvements in monetary policy formulation will provide useful support for macroeconomic stability," Murilo Portugal, deputy managing director and acting chair, said in a statement. more..
Sep 25 (TN) A special team of Colombo Crime Division arrested the owner of Churapi Achchakam (printing press), C. Kuruthev, in Jaffna Tuesday and took him to Colombo for inquiry, sources in Jaffna said. Kuruthev�s brother, the General Manager of the Tamil daily Namathu Eezhanaadu, C. Sivamaharajah, had been assassinated at his house in Thellippazhai in August 2006. Minister Douglas Devananda, had sought to acquire Churapi Achchakam to print a Tamil Daily in the name of Thinamurasu to more..
Sep 25 (Island) The Central Bank last afternoon said the medium term sovereign rating strategy brought positive results. "Sri Lanka�s sovereign credit rating has been upgraded by the international rating agencies, Standard & Poor�s (S&P) and Fitch Ratings, who have recently assigned improved credit ratings to the country. A third rating agency, Moody�s Investors Service, has also assigned a comparable credit rating to Sri Lanka, as given below. more..
Sep 25 (DM) Speaker Chamal Rajapaksa said today he would by next week forward to President Mahinda Rajapaksa the names of the two Parliamentary Council (PC) nominees selected by the Prime Minister and the Opposition Leader after the impasse regarding one of the nominees was sorted out. Mr. Rajapaksa that he had received the name of Prime Minister D.M. Jayaratne�s nominee and that of Opposition Leader Ranil Wickramasinghe who named TNA member M.A. Sumanthiran. more..
Sep 25 (CBC) A Tamil woman who has been held in custody since arriving on a migrant ship this summer gave birth to a baby girl in a Vancouver-area hospital early Friday morning. The woman, who is still in the custody of immigration officials, gave birth to a healthy baby girl during the early hours of Friday morning at an unnamed hospital, CBC News has learned. The woman's husband was also on board the migrant ship, and their child will now be a Canadian, officials confirmed. more..